Happy Christmas: A usual there will be no trains this year on 25 or 26 December, and services will finish early on 24 December (20:35 departures towards Manchester and Buxton from Davenport will be the last.) Bus news is slightly better, with Stagecoach running a basic network of services 'to major towns' until about 20:00 on 26 December only (see their website for full details) - for Davenport the nearest service will be the 192 along the A6 from Hazel Grove to Manchester. There is also an hourly bus from Stockport to the Trafford Centre for shopping fans. The rest of the Christmas holiday period (starting on Saturday 22 December) sees a confusing series of changes to services due to engineering work between Stockport and Manchester, which will see the Hazel Grove - Manchester trains running between Hazel Grove and Stockport only on some days (even though on 22 December these services are not shown on the Live Departure Board website!) , and also on some days the Buxton trains will be diverted beyond Stockport to Manchester Victoria. A page on the Northern Rail site attempts to give full details of all this, but the best plan is to check your proposed trip on the Journey Planner. Timetable change: A new national timetable period commences on Sunday 9 December. Local leaflets are available at the station, or downloadable from Northern Rail. We can't spot many actual changes in Davenport services, but it will pay to check your planned journeys. On Saturday 15 December, at the heights of the Christmas shoping season, it's been decided to disrupt our services yet again, presumably in preparation for the large amount of work in the Stockport - Manchester area which will affect services over the Christmas - New Year period. Only the Buxton services will be working thtough to Manchester, with the Hazel Grove trains running between Hazel Grove and Stockport only. A normal Sunday service (i.e Buxton trains only) will operate on Sunday 16 December. Engineering work strikes again: Sundays 25 November and 2 December there will again be a replacement bus running between Hazel Grove and Buxton, with some alterations to train on those days. Train times in the intervening week will also vary slightly. Check the online journey planner for more details. 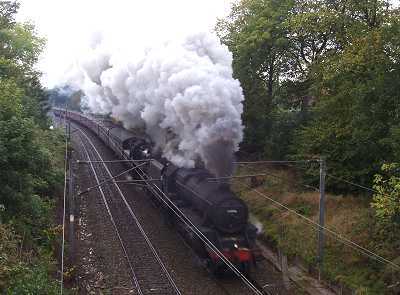 Another steam train will be visiting our line on Saturday 10 November, hauled again by 45407 and 76079 (see below). However this one will only pass Davenport in the late afternoon, departing Buxton at 16:00, and expected to pass Davenport at about 16:55 by which time it will be dark. Our picture shows 20 October's train heading back through Davenport towards Blackpool. A steam excursion, 'The Derbyshire Dalesman', will be passing through Davenport on Saturday 20 October en route between Blackpool and Buxton. For anyone wishing to travel, it is possible to join the train at Manchester Victoria: Kingfisher Railtours (0870 747 2983) are the organisers who should be able to sell you a ticket. BR Class 4MT 2-6-0 no 76079. Blackpool North d 07.13, Manchester Victoria a 09.09 d 09.21, Heaton Norris Jc a 10.00 [takes on water] d 10.55, Stockport 10.59, Hazel Grove 11.06, Chinley Jc 11.38, Great Rocks Jc a 11.51 d 11.53, Buxton sidings a 12.18 [reverse] d 12.43, Buxton station a 12.50. Buxton d 16.00, Chapel-en-le-Frith 16.18, Furness Vale 16.30, Hazel Grove 16.49, Stockport 17.05, Denton Jc 17.26, Ashton Moss N Jc 17.42, Miles Platting 17.59, Manchester Victoria a 18.05, Blackpool North a 20.26. Regular users may have noticed that some trains normally made up of a three-car electric train are currently a 2-car diesel. This seems to happen every autumn, as it has been found that when the leaves are falling, the hilly Glossop line requires an extra train to avoid late running, and this is borrowed from the Hazel Grove line. We now discover that there are a further three Sundays: 7, 14 and 21 October, between Hazel Grove and Buxton. Trains at Davenport will be at their normal times, but beyond Hazel Grove there will be a bus service all day. Passengers at Middlewood will be expected to find their way to and from the A6 Road, and of course no bicycles will be carried. Furthermore, trains between Hazel Grove and Buxton will cease after 18:00 on Saturday 6 October as well and be replaced by buses. Why didn't they tell us this before, and why don't we get informed as to why this sort of thing is required? Local Timings for the 'Buxton Forester' Railtour from Birmingham, Saturday 15 September. To pass through Davenport hauled by preserved Class 40 diesel no. 40 145, with a Class 37 diesel on the rear. GRINDLEFORD pass 13:05, SHEFFIELD arr 13:25 dep 13:31. For over 130 years, the people of Newton Heath and its surroundings have helped to keep the railways running. Come along when Newton Heath Depot will be open to the public to celebrate its railway heritage and also its place within the community. You can also learn more about career opportunities that are available within the rail industry. On the day prices: £10 for family ticket; £5 for adult; £2.50 for child. All proceeds from the event will be donated to charity. Refreshments are available on site. As there is no parking at the depot or in the immediate vicinity, the admission ticket includes the price of travel on Northern services between Manchester Victoria and Dean Lane station which is less than 2 minutes walk from the depot. There will be a train every 30 minutes during the opening times. Extra trains will run from Manchester Victoria to Dean Lane hourly from 1002 to 1602, returning at 1020 hourly until 1620, journey time 6 minutes. 8-9 September is 'heritage open days' weekend: Stockport Council have a list of events in Stockport. Of interest from the Davenport point of view is St George's Church which will be open to visitors from 11am to 3pm on both days. "This Grade 1 listed very large Victorian Church was consecrated in 1897. It was the last great Victorian Church to be fully completed anywhere in England and was part of the inspiration for Liverpool Cathedral. Described by Geoffrey Fisher (Archbishop of Canterbury) as 'The Finest Parish Church built in England since the Reformation'." An unusual problem disrupted the morning rush-hour service through Davenport on Thursday 30 August. A Southampton to Trafford Park Freightliner train was approaching Stockport at about 7.40 am when someone noticed that there was a door open on one of the containers aboard, a potential danger as it might swing out and hit a passing train. 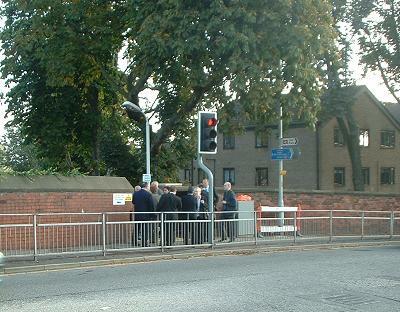 20 years ago, soon after the Hulme family first moved to Davenport, the issue of cars 'rat-running' along Oakfield Road to avoid the traffic lights came to prominence, and residents were consulted by the Council on various ideas to deter this, leading the the creation of the short one-way section of Oakfield Road, and the diversion of outbound bus services down Garners Lane. 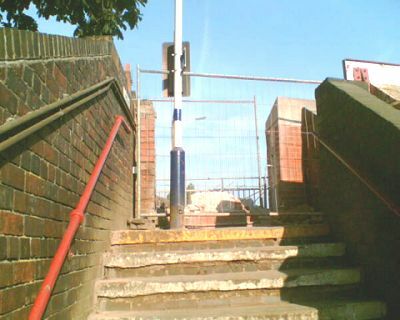 The idea of 'No Entry Except for Access' signs was rejected out of hand by the Council experts, as they were thought to be ineffective. 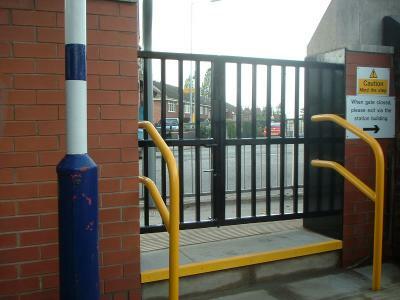 The measures taken prevented cars from the Bramhall direction running through. 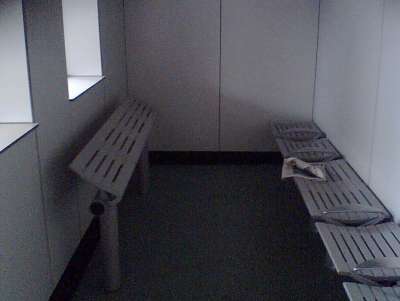 Fast forward to 2007, and 'rat-runners' in the other direction have become a problem, taken up with gusto by councillors and would-be councillors showering residents with rival leaflets during the May election campaign. We had been consulted again by the Council, who offered us three options, all of which have now been forgotten. After some talk of automatic barriers, we have ended up with ... guess what? 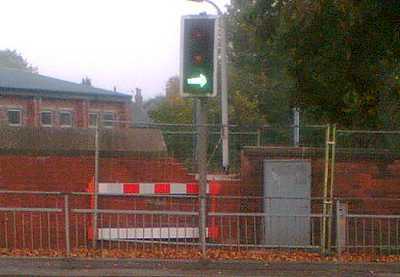 'No Entry Except for Access' signs at the Garners Lane / Elmfield Road junction, complete with pictures of Evel Knievel. Are motorists better-behaved than they were 20 years ago, and will now obey such signs? What do you think? Does anyone ever park for longer than 30 minutes on the 3-minute parking section? However, despite prophesies of doom from the Labour candidate, the 310 bus has continued to run along Oakfield Road inbound to Stockport. Users of the station may be wondering why the rails through the northbound side of Davenport station have been painted white. Not an aesthetic thing, nor a throwback to the Army's 'if it doesn't move, whitewash it' policy, but an attempt to keep the rails cool should a heatwave come along. (c) Belmont road bridge on the A6 at Heaton Norris closes completely to motor traffic, while it is rebuilt to take heavier lorries. Traffic, including the 191/192 buses, will be diverted via Belmont Way and Manchester Road, although some journeys will apparently run up to the bridge. A PDF bus timetable is available. Important: there are no trains at Davenport on Saturdays or Sundays until 1 July. Buses replacement services will be operating between Hazel Grove and Manchester calling at the stops by Cale Green Park. See the Journey planner or Timetable leaflet for details. We've prepared a 32-page booklet on the history of Davenport and Davenport station to commemorate the recent 150th anniversary of the line. 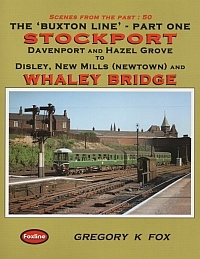 Public passenger trains on the Stockport, Disley and Whaley Bridge Railway ran for the first time on 9 June 1857, although Davenport station did not open until a few months later. Celebtrairoy events were held at hazel Grove and otherr stations. Yes, yet again we have to put up with replacement buses, which will run betweeen Manchester Piccadilly and Hazel Grove on Saturdays and Sundays from 27 May until 1 July calling somewhere in the vicinity of all stations. As usual, the Davenport stops will be at Cale Green Park / Davenport Park Road. The Northern Rail timetable leaflet is available from the station or can be downloaded. Ironically, this means that on 9 June, the day of the 150th anniversary of the opening of the line, with various celebrations going on at other stations, we won't have any trains! Not that Davenport had any trains on the first day, either - the station didn't open until 1858. 20 May sees a new National Rail timetable issued: there do not appear to be any big changes to Monday-Friday services on our line, but it will be worth checking the journey planner before travelling. Crewe line changes: Network Rail having finally managed to get the signalling of the junction at Wilmslow working again, there has been a major change to the timetable on the Manchester - Crewe line from 26 March. Unfortunately, not all the changes are improvements from the point of view of Stockport area customers, as the number of through trains from Stockport to Crewe is greatly reduced, especially on Sundays. It's been pointed out to us that, contrary to our statement here that Network Rail closed the New Mills - Buxton line for a week in February 'at rather short notice', closures of this kind are usually published within the rail industry several months (at least) in advance, and it is the responsbility of the train operator, in this case Northern Rail, to inform their customers in what they consider due time. Indeed we can tell you now that they are planning a similar 'blockade' from 18 to 26 October 2008! Our suggestion would be that there should be a note in the Northern Rail timetable leaflet warning of things of this kind, although of course there is always the possibility that such work will be cancelled; perhaps this is why Northern prefer to hold back the announcement, but you might think someone would tell the 'Folk Train' organisers. Sundays 25 March 2007, 1 October 2007, 25 November 2007, 2 December 2007. Friday 9 February 2007 was fifty years to the day when John Axon and John Creamer were killed in the famous runaway train incident at Chapel-en-le-Frith station.A large crowd, including relatives of the victims, railwaymen and local residents turned out to watch a plaque being unveiled and dedicated to the memory of that fateful day and those deaths. Thoughtful words and prayers were said and a minute's silence observed. After the assembled company warmed themselves in the station building - the weather was snowy and cold - many caught the 12:20 train to Buxton. 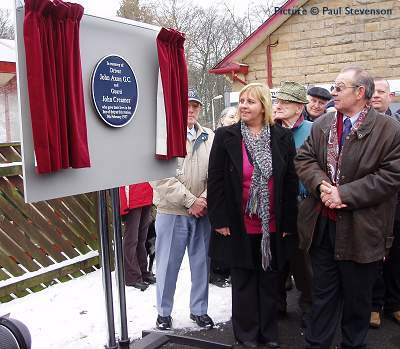 Here, in a short ceremony, one of the train's power cars was named John Axon GC. All in all a moving and emotional day dedicated to the memory of the two brave railwaymen who died and those who by their quick thinking averted a far worse disaster. It's good to see that the search for relatives of the two deceased was successful: in the picture above are Melanie Axon, granddaughter of John Axon, and David Creamer, the son of John Creamer; the two of them jointly unveiled the plaque. Two-car diesel 150 273, the train which now bears the name, is fresh from the paint shop, having previously been the very last Northern Rail train to carry the pre-1997 'Regional Railways' blue and grey colours. We've prepared a 32-page booklet on the history of Davenport and Davenport station to commemorate the recent 150th anniversary of the line. Copies are on sale for £2 each at the two charity shops in Davenport (who will be retaining for the charities the cost of any copies sold) and at the station booking office. Public passenger trains on the Stockport, Disley and Whaley Bridge Railway ran for the first time on 9 June 1857, although Davenport station did not open until a few months later. Celebtratory events were held at Hazel Grove and otherr stations. 9 February 2007 marks the 50th anniversary of the tragic accident at Chapel-en-le-Frith in which two Stockport railwaymen, driver Axon and guard Creamer, were killed in a collision between two freight trains. The accident became famous when it was made the subject of a 1958 radio ballad by Ewan McColl and Charles Parker, which is available to listen to on the BBC website. The occasion will be marked by the unveiling of a plaque at the station, and the organisers are keen to trace any relatives of the two men in order to invite them to the event. If anyone can help with this, please write to us at info@davenportstation.org.uk and we will pass your message along. 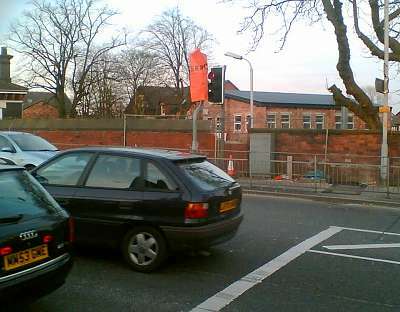 As passengers will have seen, building work has started on the houses alongside the station, which until September 2005 were Oriel Bank School. Paul Cook Developments of Bramhall submitted a proposal to Stockport Council in the spring of 2006, to return the houses to residential use in more or less their original form, three pairs of large semi-detached houses and one detached - 'villas' as they would have been called when built in Victorian times. The full details of this application can be found on the Stockport Council website, complete with a fascinating and detailed set of drawings of the houses and a plan of the intended results. The planners were not happy with the initial plan, and it refused it back in June 2006, but now a compromise has been reached and work has begun. The nearest house to the station, 2 Devonshire Park Road, is now (according to a report in the Manchester Evening News) to be developed as 'affordable' apartments by the Northern Counties Housing Association, and the builders have moved in here first, as the picture shows. The other six houses are to be restored as originally planned, and are expected to fetch of the order of £500,000 each. 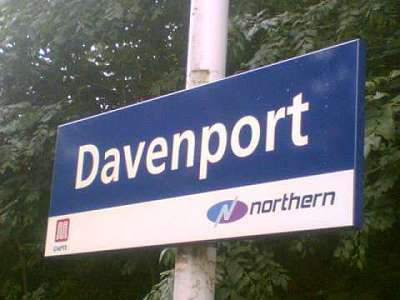 A new timetable takes effect nationally from 10 December: copies of the Davenport line leaflet are available from the station and will presumably be available in PDF form on the first day from the Northern Rail website. The timetable book for the whole country is on sale at £12 from Smiths at Piccadilly. 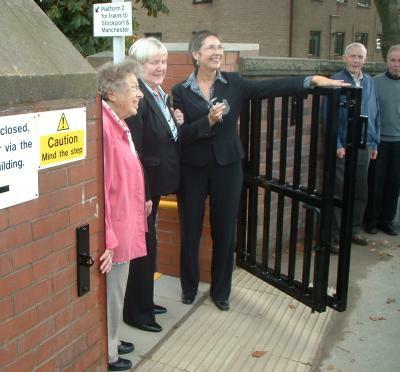 At the re-launch meeting on 23 November at Davenport Methodist Church, organised by Steve Magner of the Greater Manchester Passenger Transport Executive, the 'Friends of Davenport Station' group was formally founded, and a consititution adopted. Davenport Councillor Roy Driver also attended the meeting. Michael Cain is Chairman of the Group, and Tril Sutherland the Secretary. Watch this page for details of further events and activities. At the meeting we asked about the proposed CCTV for the station, and the promise made (by Northern Rail?) 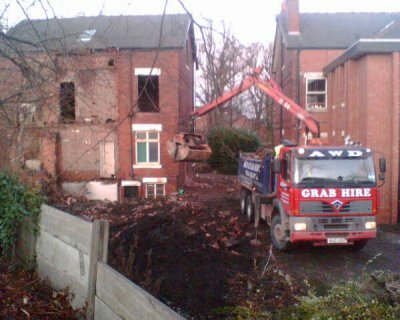 to hire contractors to clear the Japanese Knotweed infestation so that gardening can resume. Apparently no date is available for either of these at the moment. 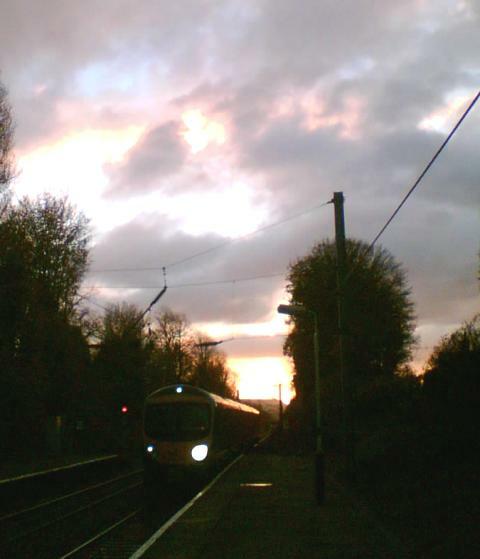 The sun rises over Black Hill as a new TransPennine Express Class 185 train rolls through Davenport station, November 2006. Thursday 23 November, 7:30pm onwards, Davenport Methodist Church, Garners Lane: ther will be a re-launch meeting for the 'Friends of Davenport Station' group. Everyone is welcome. See our Friends Page for more about the Friends group. A small ceremony took place on 13 October to mark the completion of the additional entrace to Davenport station, which will allow more direct access to the platforms in the afternoons and evenings, and all day Sunday, when the booking office is closed. Ann Coffey MP, who has been a great help in finally realising this simple enhancement. No traditional ribbon or scissors had been provided ... Ms Coffey prepares to make the first swing of the new gate. All these pictures are by Joanna Hulme. Here it is, from the inside. Unfortunately there is a step to be negotiated, but as there are steps to the platforms anyway, so accessiblity for wheelchairs, etc. is no worse than it already was, i.e. awful. Well and truly open! It is over a year since this site reported on the first attempt to knock a hole in the wall, and many years since station users first suggested the idea in the late 1980s after the staffing level of the station was cut back to mornings only. Thanks are due to Ann Coffey, the Greater Manchester Passenger Transport Authority, and everyone else who has made this possible. It is hoped that CCTV will also be provided for the station in the near future. Under the spreading horse-chestnut tree: the view from the other side of the road showing the location of the gate. 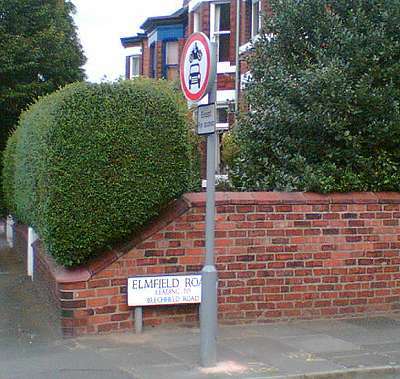 It will be especially useful for passengers living on the east side of Bramhall Lane, and those making bus connections in the Bramhall direction. The Mid-Cheshire Dalesman: Our friends at the Mid-Cheshire Rail Users' Association have chartered a train frm Northern Rail for a day trip to the famous Settle - Carlisle line on Sunday 29 October. This train will pick up passengers at Stockport (approx. 10:09, returning approx. 19:30) and will call at Settle, Ribblehead (where a conducted walk to the famous viaduct will be available), Dent, Garsdale, Appleby and Carlisle. The train used will be two of the Class 156 units - the ones with tables and large windows - and fares are very reasonable: Adults £26, Senior Citizens (aged 60 and over) £24, Children (aged 5 to 15) £20. Buxton and New Mills calling at stations where the train normally calls. Sunday 1 October: The replacement bus service will run between Buxton and Stockport calling at intermediate stations. Trains will start and terminate at Stockport: the beses will call at the stops by and opposite Cale Green Park in Davenport as usual. Diversionary tactic: a reminder that, although Saturday services have returned to normal, Sunday traiins are still diverted to Manchester Victoria on Sundays 3 and 10 September. Full details are in Northern Rail's leaflet available online or from the station. Victorian Saturdays: In addition to the Sunday diversions to Manchester Victoria mentioned in the item further down this page, it appears that the same also applies on Saturdays 5, 12 and 19 August, although at the time of writing this is not shown in Northern Rail's timetable leaflet or on their website. We advise users to check before travelling. Update, 4 August: it appears that the engineering work planned for Saturday 5 August on the Manchester - Stockport line has been cancelled at short notice, and the line will be open for trains. Trains to Crewe and Macclesfield will be running between Stockport and Manchester. 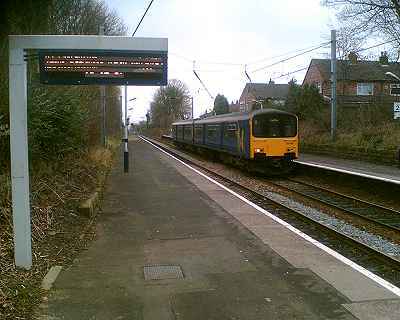 However, Davenport will still be served by a Buxton - Stockport - Manchester Victoria hourly service as originally planned, and the Hazel Grove workings will be replaced by a bus which will run between Hazel Grove and Stockport only, calling at Davenport and that stop that is vaguely somewhere near Woodsmoor on Bramhall Lane. New timetable: There is a timetable change from Sunday 11 June, but the times of trains on our line (here is the timetable leaflet) appear to be much the same as before. However, on Sundays from 30 July to 10 September, trains will run to and from Manchester Victoria instead of Piccadilly, not calling at Heaton Chapel or Levenshulme, and departing Davenport later (32 minutes past the hour) in the Buxton direction. 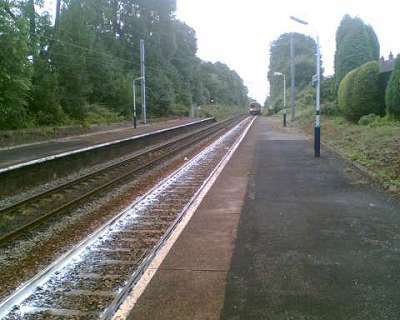 The Sunday trains to the Hope Valley stations will run until 23 July, as in earlier years, but (irritatingly) they are running non-stop from Stockport to Hazel Grove, not serving Davenport or Woodsmoor. Cheadle Hulme to Crewe reopens for crew training on Monday 19 June. The Piccadilly-Manchester Airport-Wilmslow shuttle will continue to operate and will be extended to also operate at weekends. The junction at Wilmslow and the points at Alderley Edge and Sandbach will not be in operation, so trains from the Styal line will not be able to proceed beyond Wilmslow. There is to be another lengthy engineering 'blockade' after Christmas to fully commission the new signalling. It is perhaps worth noting in this context that Network Rail, the company responsible for this disgraceful situation, has in May 2006 awarded a £352,728 bonus to its chief executive, John Armitt, whose basic salary is more than £500,000. The deputy chief executive, Iain Coucher, will receive a bonus of £314,490. Bus improvements: Good news on the local bus front is that extra journeys have been introduced on Stagecoach route 378 which calls near Davenport station. Buses now run every 15 minutes between Grove Lane and Stockport, Monday to Saturday daytimes, and every hour on Sundays and Public Holidays. Brand new 'Easy Access' single-decker buses have also been introduced. These improvements have been carried out with the aid of a £358,250 grant gained through the 2005 Kickstart Bus Challenge Competition, under which the Department has provided £20 million to local authorities for 43 improvement schemes throughout England. It's a brave experiment in this area of high car ownership; let us hope that it becomes a lasting success. New book about our line: books about the Buxton line are few and far between, so it's good to see well-known local author and publisher Greg Fox remedying this with his latest production. Based around the photos and diaries of of the late Wallace Sutherland, who lived in Davenport, the book has lots of pictures of our station and line in the 1950s and 1960s, and all the history you'll ever need. Copies are on sale for £16.95 at Brookside Garden Centre in Hazel Grove or Ian Allan's bookshop on the Manchester Piccadilly station approach - see also the Foxline website. Good news ... or bad? A firm of consultants have been working for some time on a study of Northern Rail's operations, which was widely rumoured to recommend widespread Beeching-style cuts. It's now been published (here it is in PDF format) and guess what? it says that cutting services would not save much money and would create bad publcity and damage the economy of the area, so don't bother. Sighs of relief all round, but could it possibly be that rumours of cuts were spread to make us fear the worst, and thus be pleased when we found that there would be no service improvements or new rolling stock? Picture News 1: The current road junction works outside the station, as well as laying out a Sudoku grid on the road, include the relocation of the traffic light which was blocking the proposed new exit from the Manchester platform. Picture news 2: Our new waiting room is now open weekday mornings, complete with its automatic doors which open whever anyone walks past outside ... rather clinical décor, isn't it? 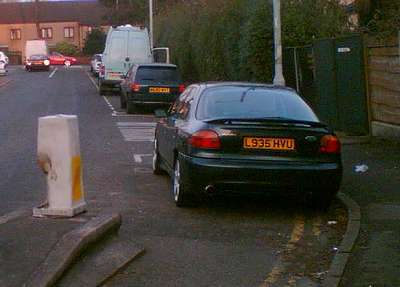 Picture news 3: The 'one-hour-limited' parking places in Oakfield Road seem to be in need of some enforcement, one might think. The car in the foreground creates a nice hazard for cyclists using the cycle-only lane, and the one in the background won;t be moving for a whle as it appears to be waiting for repairs after a serious accident. Wellspring Model Railway show: On Saturday 18 (10:00 - 18:00) and Sunday 19 March (10:00 - 17:00) there is a Model Railway Exhibition at Stockport Guildhall, Wellington Road South, to raise funds for The Wellspring, a resource centre for the homeless and disadvantaged of Stockport. There will be 16 layouts, fully supported with trade stands, and refreshments available. Good to see all the train indicators working again after three months ... rumour has it that someone forgot to arrange a maintenance contract! 24 February. Crewe line opening delayed (very annoying news release): The reopening of the railway line between Sandbach and Wilmslow has been delayed to enable the completion of infrastructure improvement works. The line will now not open until early June whilst vital testing work is carried out on a new signalling system. The line has been closed since December and was due to reopen on March 26, once the existing life-expired signalling system was replaced by a new computer based interlocking system. However a number of compatibility issues between the Italian system and the UK railway infrastructure have meant further testing is required to enable completion. As has been the case since the blockade began in December, long distance services are being diverted with replacement coaches running between Wilmslow and Macclesfield. Local trains will continue to be replaced by a high quality coach/bus service, with links to Congleton Station from Holmes Chapel and Sandbach during peak periods. Trains will also continue to run between Manchester Piccadilly and Manchester Airport until the works are completed. 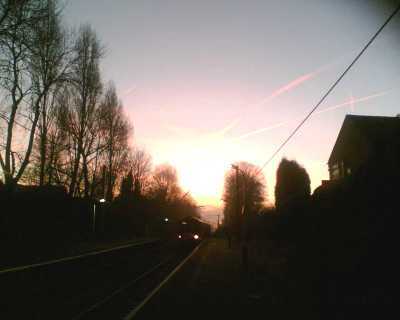 Trains will also continue to run between Wilmslow and Manchester Piccadilly via the Styal line (Wilmslow to Manchester via Heald Green) during weekdays. A direct service is also available between Crewe and Manchester Oxford Road during weekdays. Trains between Hazel Grove and Manchester will run at the normal advertised times. Under new management: Welcome to the new operatord of the 'Davenport News' shop opposite the station. We wish them well. Fares increase: At the start of 2006 Northern Rail, line most other train companies, increased their fares. A return ticket from Davenport to Manchester is now £4.00 before 09.30 Mondays - Fridays, £2.20 at all other times. However it is worth bearing in mind the various special tickets provided by GMPTE which can often save money, especially in the evenings. Here is a page about these on the GMPTE site. Unhappy New Year: Northern Rail have decided, at very short notice, that they don't have enough 'resources' (Staff, presumably) to run the train service on the Buxton line on New Year's Day, 1 January 2006. Instead, we have an hourly replacement bus service. The bus times, which are as different from the expected train times as could be arranged, are: to Buxton at 09:30 from Davenport and hourly until 23:30, and to Manchester 09:40 and hourly until 23:40. The last bus returns from Manchester Piccadilly at 22:50. Buses will be stopping, we assume, at the normal replacement bus stops by Cale Green Park, although this is not stated on Northern's hastily-produced posters. If you are travelling to anywhere else, we'd recommend telephoning 0847 48 49 50 as soon as possible to check your train times. On New Year's Eve, the last trains at Davenport on 31 December, according to the National Rail Journey planner, will be the 20:31 from Manchester Oxford Road to Buxton, due at Davenport 20:51, and the 21:38 Buxton to Manchester, due at Davenport 22:18. As for Stagecoach Buses, New Year sees a Saturday service on New Year's Eve with last buses around 8pm, then 9 special services (including the 192) through the night until 4am. On Sunday 1 January there will be No Stagecoach Bus Services apart from bus 43 from Manchester to the airport. Timetable change: A new timetable takes effect from Sunday 11 December: however, as far as our line is concerned it seems to be very much the same as the old one, with perhaps a small change here and there. The new timetable leaflet is now available as a PDF Download, and of course the on-line journey planner will give you the correct times for your journey. The main thing to note is that for the next three months or so there will be no trains at all, on any day, on the Cheadle Hulme - Crewe section, due to yet another bout of engineering works. The Hole in the Wall Gang: This 'damage' to the wall of the station bridge which appeared a few weeks ago was not accidental! For some time we have been promised a direct entrance to the Manchester-bound platform to avoid the long detour when the booking office is closed, and this represents the first attempt at creating this. Apparently, one man with a drill was sent along with orders to make a gap in the wall, but someone had not taken account of the fact that this wall, dating, we believe, from about 1980, is made of brick-clad reinforced concrete. The attempt was abandoned, and now we await further developments. It will be finished, we are assured. More Saturday disruption: Saturday 5 November will see a repeat of the Manchester Piccadilly station closure of 16 October. Buxton trains will be running to and from Manchester Victoria and the Hazel Grove - Manchester Piccadilly shuttle service will be replaced by a bus. Let's hope the latter operation is less shambolic than last time. 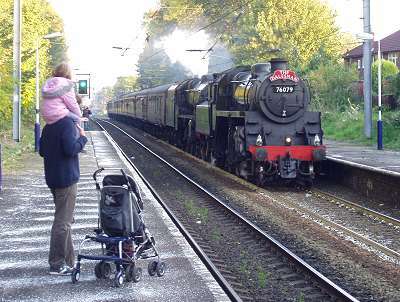 Steam Special, 22 October: The steam-hauled excursion from Milton Keynes to Buxton made a spectacular display for the spectators at Davenport station. Running half an hour late, it was sent up the line just ahead of the 13:51 service train to Buxton, and the crews seemed to make every effort to stay ahead, with the damp weather enhancing the effect of the steam and smoke which surprised passing motorists and pedstrians as the train stormed under the station bridge. The train was double-headed by 76079 and 45407, Ian Riley's two Bury-based locomotives, although 45407 seems to have gained yet another new identity as a travel-weary loco of the 1960s. Train 1Z54 07:21 Milton Keynes Central - Buxton ... Manchester Victoria pass 11:39, Ashton Moss North Jn pass 11:51, Heaton Norris Jn 12:07-13:00 (water stop), Stockport pass 13:04, Hazel Grove pass 13:13, Furness Vale pass 13:29, Buxton arrive 13:55. Train 1Z76 16:05 Buxton - Milton Keynes Central. Buxton dep 16:05, Buxton sidings 16:11-16:16 (reverse: assisted to Peak Forest by diesel loco on rear), Tunstead 16:35-16:36, Peak Forest 16:41-16:51, Chinley South Jn 17:01, Chinley North Jn 17:12, New Mills South Jn 17:18, Hazel Grove pass 17:29, Stockport pass 17:41, Heaton Norris Jn 17:43, Manchester Victoria 18:16-18:36. The train will be double-headed by 76079 and 45407, Ian Riley's two Bury-based locomotives. Note that, unless late changes are made, the train will pass through Davenport twice, travelling up the steep climb through Middlewood and back down the 'chord line' into Hazel Grove. Sunday 16 October: Trains are running betweeen Buxton and Chorley via Manchester Piccadilly: Northound trains are running at the normal times, southbound ones are re-timed to run ten minutes later than normal.